Gobbledygook at the Township Committee meeting to occur on November 26, 2018. Are they kidding? 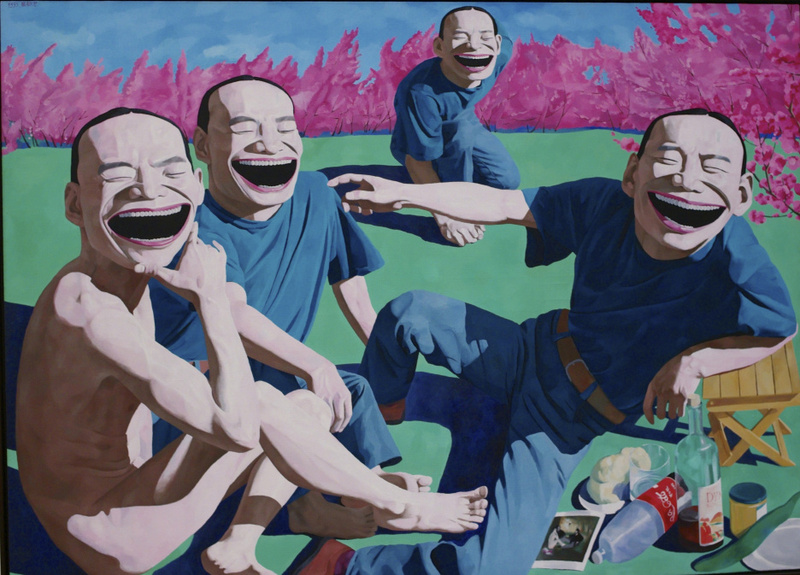 “Le Dejeuner Sur L’herbe” by Yue Minjun. Paul Goldfinger photo. Princeton U. Art Museum. There will be a resolution on the menu for the November 26 Township Committee meeting regarding a new plan for the Ocean Grove North End. The language is such that it will be very difficult for any of you citizens who are not lawyers to know precisely what is going on. The resolution is long and has multiple parts, and they probably won’t read the whole thing at the meeting. But either way, it will leave your head spinning due to lack of transparency and lucid explanations of what it all is about. About 6 months ago, the President of the CMA said that a new plan would take effect soon. Lately a new redeveloper (OGNED) appeared on the North End scene and has been “negotiating” with the Township. That group is called Ocean Grove North End Developer. It is a “joint venture” consisting of WAVE and a few more LLC players. If you want to read the entire new Resolution, go to neptunetownship.org and click on agendas/minutes. Then click on Township Committee and choose the agenda for Nov. 26, 2018. In brief, the title of the Resolution #18-395 says “Authorize the execution of a conditional designation and interim cost agreement with OG North End Development (OGNED) including provisions for a deposit of project funds to defray costs incurred by the Township of Neptune in connection with the negotiation of a Redevelopment Agreement, pursuant to the local redevelopment and housing law, N.J.S.A. 40A:12A-1, ET Seq.” Got it? a. The project site is now 3 acres, not 5 acres as before. The entire new plan is about half the size of the original 2008 NERP. d. The Township has decided that OGNED has the “necessary experience and qualifications” to implement the Proposal. e. The Township and OGNED must negotiate a Redevelopment Agreement. f. CMA, the land owner, is no longer designated as a co-redeveloper, as requested by WAVE. g. With this Resolution, OGNED is designated as the “Conditional Redeveloper of the Project Site.” This is pending further negotiations involving the Township. If they cannot agree to a Redevelopers Agreement, then the deal is terminated. We are concerned that the proper redevelopment legal procedures are not being followed as this “new Plan” is propelled into reality by this Resolution. Of course, we are not lawyers, and wouldn’t it be great if the Home Groaners hired an expert to vett this stuff for we the people? B. What is the relationship of the original (2008 and still in effect) NERP to this new “proposal?” Could the OGNED developers decide to change their minds and shift gears back to the original and larger NERP provisions? C. the Resolution says that the original 2008 NERP has been “amended from time to time,” but that is not true. D. A sketchy presentation of the “new proposal” is found in the resolution, but does this Resolution pretend to officially approve the “new proposal” now? The title doesn’t say that. E. Is there an engineering estimate of the cost of this project? F. The resolution gives OGNED exclusive negotiation rights with the Township. Why has there been no bidding requested to let other developers have a chance to get this project? The redevelopment law requires bidding. Does approval of this Resolution indicate approval of the new “scaled-down” North End Re-Development Plan? There are 34 items listed as part of the “scope” of the plan, and there are few details. So how can such a plan be approved now? H. It’s been ten years. The Township owes it to the people of Ocean Grove to reconsider the out-of-date “Zone in Need of Redevelopment” designation. Why should these developers with their new “Proposal” be given a free ride to overthrow the original single family zoning? There is nothing about that property that would make the North End site in need of re-development. The CMA and OGNED are perfectly able to develop that area without local government handing them zoning relief. I. And finally, after 10 years of diddly-squat at the North End, are they kidding?? It’s time for folks in OG to do what the Asburians have, at least temporarily, convince the Township that what was agreed to a decade (or more in North Asbury) ago is no longer appropriate, given the growth and change that has occurred somewhat organically in OG and to the north in AP. Neptune, with the input of CMA or OG HOA, needs to stop and rethink/re-scale the north end project. Underground parking in that location makes no sense…it will be flooded anytime there is a storm surge tide! “Bishop wasn’t planning to share the diagram with the public, but when challenged by citizen Jack Bredin, and with the approval of the Township Attorney, Committeeman Houghtaling handed a copy to Bredin. We think the cutback in scale for this “Proposal” is probably due to lack of money for the original NERP, but, or course, we get no explanation at this time. There are so many questions that will be unanswered when they vote on this Resolution tomorrow (Nov 26, 2018). We had referred to the design for the North End as “The North End Plan.” The changes now announced in the current resolution refer to the “Proposal.” Hopefully the Neptune Comedy will explain the difference to the attendees at tomorrows meeting. For 10 years, Ocean Grove taxpayers have witnessed incompetency and lack of transparency on the part of CMA and Twp. Ignorance of climate change, recent major storms –and past northeasters and hurricanes is their third “governing” detriment. It’s delay lawyer-talk. Give us lots of room: “interim,” “conditional.” Don’t get us committed, don’t box us in: let us just screw you with attrition and hope your interest fades. That won’t happen here. They are piling on layers of players to suppress dissent. But we have a way of pushing them off, don’t we? They won’t stop. We have to stop them. Open space, sea breezes into town, cleanliness, sand, sea, and surf and decency. We don’t need another bistro or zombie shopping addicts. The key term here is “conditional”. With a provision for “deposit of project funds.” So if money is “deposited” we will know they are out of the first inning. Other than that, Mr. Radar notes the absence of any proof that underground parking is viable. That is a very simple thing to do. Call the guy with the drill (the same one everybody uses around here), who does a boring, determines the location of the water table, and turns the results over to an engineer to determine seasonal and other variation. How hard it that? I really think the Township should be forced to turn over the results when that happens. Or permit an independent assessment to be commissioned, which would not be more than a couple thousand dollars if that. We will then know that an underground garage is not viable.